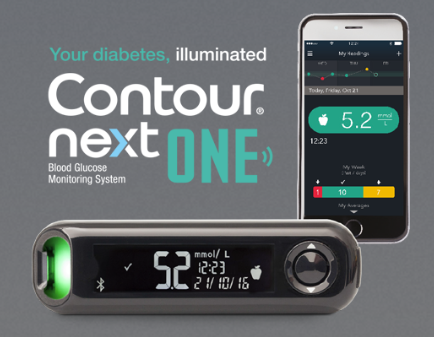 Discover smart blood glucose testing with the CONTOUR® NEXT ONE meter and CONTOUR® DIABETES app. Sorry as you are under 16, you cannot enter. Please speak to your parent or guardian. Ascensia Diabetes Care Ireland Limited takes your privacy seriously. We will never sell or give away your information. We protect your information, and insist that those who work with us do the same - for example, the companies we use for sending out meters. † Only one meter from the Contour® range is supplied per person every 18 months. You are only eligible for a free meter if you have diabetes. If your meter has broken and you need a replacement, please call us on 1 890 920 111 (Mon-Fri, 8am – 8pm). Your request has been received. If your application is successful you will receive your Contour Next One meter in the next 10-14 days. Please note that, only one meter from the Contour® range is supplied per person every 18 months. If your meter has broken and you need a replacement, please call us on 1 890 920 111 (Mon-Fri, 8am – 8pm). This form could not be submitted at this time. Please try again or contract Ascensia Diabetes Support - 1 890 920 111 (Mon - Fri, 8am - 8pm). © Copyright 2016 Ascensia Diabetes Care Holdings AG. All rights reserved.